The times really are 'a-changing'. Technology has changed our world and has had a profound effect on just about everything else we know. Within technology, things are always in flux. It is its nature. A perfect example is how we search and how we do SEO. From the beginnings of the Internet, it was necessary for the vast amounts of information to be cataloged and organized. In such a way that the average user could navigate with ease. It was this necessity that search engines were born. Since then search engines have become a competitive, ever-changing force. Recently both Google and Bing have begun a sort of battle for search supremacy. Culminating with loads of new features to the benefit their users. These new features combined with the already streamlined process of search. Makes exciting new times for users and marketers alike. When someone searches a term on any major search engine their location can influence the results. IP address or GPS location if they are on mobile, are logged and taken into account when results are served. The searcher has access to information that is more relevant to their query because it is specific to their location. When you search for a restaurant, movie, events, weather forecasts, or just about everything, location specific results will be displayed. This lessens the need to be specific in searching (ie. Weather "Zip Code") saving you time and keystrokes. To marketers this mean you need to include your address on websites. You need to get local (ie. Google places). Keep an eye on the terms people in your area are using to find products or services that are similar to yours. You then can tweak your keywords or phrasing to reach the maximum audience. Delivering up to date information is the bread and butter of any good search engine. So all major companies have put a lot of time and effort into providing that to their users. One of the more recent additions to sever major search engines is the ability to sort your results with the most up-to-date information. To your average user, it means that they can stay in the loop. Be one of the first to know important news and ensure that the facts they are reading are the latest known. This does come with the double edge that sometimes information may not be fact-checked or validated. Google and Bing combat this by only allowing trustworthy and authority sites in their time relevant search results. As a marketer, this means you must update your website consistently. Establish yourself as a trustworthy and up-to-date source. We live in an increasingly social world. Digitally social, true, but social nonetheless. As such it was only a matter of time before search engines applied the social networking to their results. Google and Bing, both have dedicated spots on their results pages for social interaction. Google with their in-house Google Plus, and Bing with Facebook. Both also have places for Twitter interaction. Where you can see what your 'friends' liked related to your query. You, the social searcher, can stay connected to your friends. Get tips and advice from them and make decisions based on their contributions. To the marketer, this connectivity should reinforce in your mind that social connectivity matters! For the love of all make it easy for your users to connect and interact with you and each other from your website. This concept isn't necessarily new but Google and Bing have seemed to devote some resources and page space to similar searches. An example would be when you search the name like a celebrity. You will be given your results with pictures and names of similar people. The feature does not stop with people either. Just about any noun that you search may turn up a section of 'similar results'. If you are just an average, casual user, not much. It may lead to some excessive clicking though if you get on a subject that really interests you. For everyone else, it means the possibility of increased visibility. If you create a website with similar content and is a trustworthy source. You have a chance at ranking in the similar results requests. Front Page Shopping, Images, Maps, News, Etc. Marketers have yet another foe in the battle for front page supremacy and that is the search engines themselves. Search engines are making a push for their own proprietary results. Like shopping sites, maps, news, and much more. Now when you search most nouns chances are that before you seen any real results from the web. You will see their own images, maps, news, or shopping results. Well for the average user the intuitiveness of this is a fantastic thing. You don't have to navigate to separate image or map sections. This reduces the number of clicks and time you spend searching. For marketers, this means you have got to be on top of it. You must have a presence everywhere that applies to your business or service. Get on online directories, add your e-commerce products to shopping sites, keep your website up to date with news. This can be a difficult and time consuming process but the payout is worth it. On page answers to your queries is the new golden child of every major search engine. 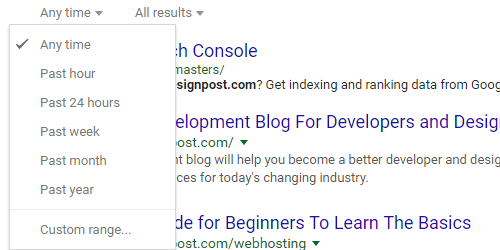 Instead of your search's result being a link to visit another website. Search engines are gathering content from other websites and publishing it to their front page. Searching of a famous person in Google will show a small bio and picture somewhere above the fold. Type in a math problem in Google or Bing and your first result will be the solution. Typing the word "weather" will combine two of the futuristic approaches to search, location and front page. The result will be the current weather forecast in your area. It means you spend much less time searching for information and consuming and acting upon it. Honestly, from the perspective of an Internet user this new feature is brilliant. From the perspective of a marketer, this could mean that your website content could be poached. Your content will be used with little or no knowledge and credit. Since it is a fairly new feature my inclination is that it will be tweaked and things made as fair as possible. We'll see what the future holds but for now I remain skeptical. Hopeful the rightful owners of content will be credited where credit is due. Not every search engine has been quick to include incentives for searching with them. In fact, I can only think of one, but it is the search engine I prefer and a feature I appreciate. Bing Rewards. In short, you receive points for searching or using other features of the site. These points are redeemable for gift cards. A lot of factors go into deciding what search engine works for an individual. Including incentives to use may mean that while you get as good or better results. You are also getting rewards for trying something new. It's a win/win. For the marketers out there it may mean a changing of the guard. If enough people are sold on incentives. Search results we all may be pandering to a new search engine master.